Yandex Maps is a Russian web mapping service developed by Yandex. The service provides detailed maps of the whole world. It includes a search, information about traffic jams, routing and street panoramas. The service was launched in 2004. Yandex Maps is the most popular cartographic service in Russia. It has about 11.5 million users in Russia per month, and over 20 million worldwide. The service initially had maps only of Russia and Ukraine, but now includes world maps. Maps are available in four versions: maps, satellite images, satellite images with captions, and legend (hybrid). Users can measure distance and get directions by dragging between spots on a map. The search is available by both geographical objects (addresses, streets, cities, regions and countries) and by organizations. The illumination of the district, city or region is available after searching the organization on the site. Yandex Maps has a mobile application for iOS, Android and Windows phones. 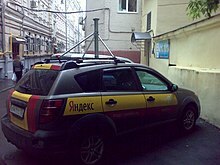 On Yandex Maps it is possible to view street panoramas. There are street view even of Pripyat and Chernobyl. In 2016 a "street view" of Everest was photographed. Users can make new data on the map with the help of the Yandex.Map editor. Yandex Traffic is a feature on Yandex Maps that displays traffic conditions in real time on major roads and highways. It can be viewed at the Yandex Maps website, or via the app. Yandex Traffic works by analyzing the GPS-determined locations transmitted to Yandex by a large number of mobile phone users. By calculating the speed of users along a length of road, Yandex is able to generate a live traffic map. It processes the incoming raw data about mobile phone device locations, and then excludes anomalies such as a postal vehicle that makes frequent stops. When a threshold of users in a particular area is noted, the overlay along roads and highways on the map changes color. A satellite mode of Yandex Maps is not as detailed as Google Maps. It has detailed maps only of Russia, Belarus, Ukraine, Turkey and Kazakhstan. The editing functionality of Yandex Maps is currently available only in Russian language. Street view is available only for cities of Russia, Ukraine, Belarus, Kazakhstan, Armenia and Turkey. ^ "8 Best Alternative to Google Maps - Classic old Map - GIS MAP INFO". Igismap.com. 30 May 2015. Retrieved 27 October 2017. ^ a b Privat, Ludovic. "GPS phones generate traffic information in Russia". Gpsbusinessnews.com. Retrieved 27 October 2017. ^ ""Яндекс" запустил георекламу". Comments.ru. Retrieved 27 October 2017. ^ "Реклама на Яндекс.Карты.ru". Mediaplanerist.ru. Retrieved 27 October 2017. ^ "Панорамные снимки еще десяти городов России опубликованы на "Яндекс.Картах"". 1prime.ru. Retrieved 27 October 2017. ^ a b c "9 Map Apps Alternative to Google Maps". Bettertechtips.com. 22 June 2017. Retrieved 27 October 2017. ^ "Яндекс.Карты обновили панорамы Припяти и Чернобыля". Popmech.ru. Retrieved 27 October 2017. ^ "New, Chernobyl panoramas on Yandex Mapsmaptd". Maptd.com. Retrieved 27 October 2017. ^ "Unique panoramas of Everest appeared on Yandex Maps . They were made during an expedition 7 Summits Club!". 7 Summits Club. Retrieved 27 October 2017. ^ In, Lee (31 March 2016). "Encyclopedia of E-Commerce Development, Implementation, and Management". IGI Global. Retrieved 27 October 2017 – via Google Books. ^ "Афиша Город: Кто составляет карты "Яндекс.Пробок" – Архив". Gorod.afisha.ru. Retrieved 27 October 2017. ^ Rankyweb (7 April 2016). "Yandex Maps Review - DownloadMaps.org". Downloadmaps.org. Retrieved 27 October 2017. ^ Privat, Ludovic. "Yandex Revamps Interface, Adds Crowdsourcing to Maps". Gpsbusinessnews.com. Retrieved 27 October 2017. This page was last edited on 17 March 2019, at 19:23 (UTC).